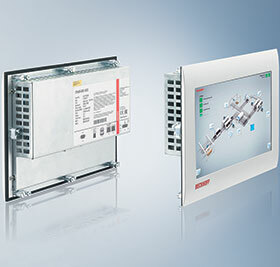 The new price/performance class of touch panels from Beckhoff, first launched with 18 cm displays, has been expanded by three built-in devices with 26 cm wide screen displays. PC-based control technology in the cost-sensitive, lower to middle performance range can now be scaled more finely and precisely in line with individual application requirements. The TFT touch display of the new panels in modern widescreen format with a resolution of 1024 x 600 WSVGA paves the way for comprehensive operating and visualisation options. Added to this is superior display quality with 16,7 million available colours on the 18 cm diagonal screen. The latest additions to the entry level class include two fanless panel PCs and a purely passive control panel, permitting the cost-effective implementation of control and visualisation tasks for small and medium-sized machines, production systems and buildings. Equipped with a robust metal housing consisting of an aluminium front bezel and a steel sheet cover at the rear, the devices offer significantly higher quality and durability than the plastic panels typically offered in the low cost, entry level segment. In addition, the high quality materials and rounded front bezel lend a modern and appealing look to the panels, which can be used in the most diverse production and building environments at operating temperatures from 0 to 55°C.